Spray designed to remove tar stains. 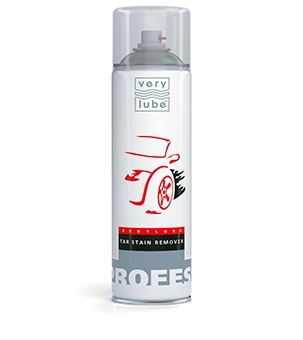 Quickly and effectively removes tar stains from the surfaces of a car. Cleans glass, metal, pain and chrome-plated parts from tar stains. Removes exhaust spots (soot and oil). Used to eliminate the previous anti-corrosion and anti-gravel coating. 2. Spray onto the surface to be cleaned. 3. Wipe off with a sponge or wash with water after 5–10 seconds. Do not use for leather cleaning! Avoid getting onto non-painted plastic parts of a car body or number plates! If occurred, wash off with water immediately! Neutral to lacquer coatings of any type.